GamePacks can have a set of settings for customization. The settings are usually made using the controller, as explained in the GamePack instructions. However, you can also customize a GamePack using the configuration interface, by clicking on the slot number associated to the GamePack. This allows you to pre-configure all of your settings without having to use the in-game menu system saving you lots of time. Each configuration is displayed in an easy drop-down list that allows you to choose one value from a list of available options. When a new value is selected this is the value that will be programmed to the CronusMAX PLUS and used by your controller. Check this option to include this configuration when programming the CronusMAX PLUS device slots. 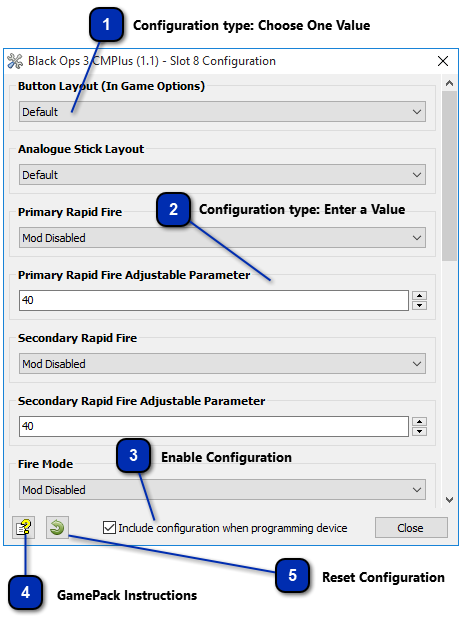 The slot settings on the CronusMAX PLUS will be overwritten by the current configuration, the changes made directly on the controller itself using the menu system as inctructed in each GamePack will not be reflected in the Configuration Interface. The instructions of how to use each GamePack can be accessed by clicking the help button. If it cannot locate the manual page, run the Manual Updater to ensure you have the latest version of the manual chm help file.